"Map Showing Location of the Famous Connellsville Coal Vein," circa 1890. Few Pennsylvania counties bore the imprint of bituminous coal mining more dramatically than Fayette County. During the first two-thirds of the nineteenth century, the southwestern county was economically and socially undistinguished. Although home to a number of small industries, including iron, boat building and glass, its physical isolation and rugged topography made it ill-suited for large-scale manufacturing or even agriculture. But the discovery (and subsequent exploitation) of three distinct coal beds which underlay the county dramatically changed Fayette County's course into the twentieth century. The Connellsville seam, the most important of the three beds, contained the best coal in the country for the making coke, which fueled the growing iron and steel industry after the Civil War (see First Mining of Pittsburgh Coal). Mine operators large and small gravitated to Fayette County in hopes of striking it rich. By 1880 Fayette County was the largest producer of coke in the country, and was contributing mightily to the state's production of coal. The H.C. Frick Coke Company became the county's largest operator, followed by companies such as Pittsburgh Coal and Coke, Washington Coal and Coke, and the New York based W.J. Rainey Coke. Many mines and coke works would become "captive" - owned and operated by iron and steel companies that used the coke to fuel their furnaces. Collier Mine tipple and mine buildings, ca.1940's. The distinctive coking process, which "cooked" or processed coal in beehive-shaped coke ovens, gave the Connellsville region a distinctive look. By the late nineteenth century, Fayette County was honeycombed with mines and intersected by rows of beehive (and later, rectangular) ovens which cropped out from hillsides. Population growth accompanied this booming extractive enterprise. In 1880 an estimated three-fourths of the region's workforce labored in coal or coke. In no other region of the country was an area more completely dominated by a single industry. As was the case in other bituminous coal counties, recently arrived immigrants from southern and eastern Europe filled the demand for labor. By 1880 a thousand immigrants were already working in the Connellsville area, supplementing the native-born labor supply. Company built house at Continental No. 2. Fayette's physical isolation compelled operators to build housing and eventually entire towns to attract and maintain a stable workforce. Outside of Connellsville and Uniontown, virtually every town built between 1880 and 1920 owed its existence to a coal or coke company. Initially, coal and coke companies built only stores for the employees. But by the 1880s, entire towns arose, typically designed along the same pattern: usually, a narrow street lined with rows of semi-detached "double houses." Depending on the community's size - most consisted of no more than a hundred or so houses - patch towns also supported a church, a school and a few other scattered community buildings, along with the usual mining accoutrements such as tipples, wash and supply houses, and the ubiquitous company store. There was often very little variation in housing; at best, a handful of larger houses, usually two-and-a-half-story wood-frame structures, supplied the needs of managers. Companies built these homes adjacent to the mine or coke ovens so that managers could be close by during emergencies or strikes. Coke Works in Shamrock, 1963. 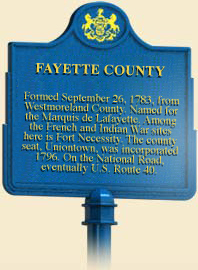 While Fayette County's company towns shared many of the same attributes, variations did emerge, often based on the preferences of the company officials who built them. As the county's largest operator during the late nineteenth and early twentieth century, the H.C. Frick Coke Company was likely responsible for more company towns in Fayette County than any other firm. While its patches such as Ralph and Shoaf were not identical, they shared common features. Most of the housing stock in Frick's towns tended toward wood-frame, double-family, semi-detached units with gable ends. The company built only a handful of single family homes, reserved for foremen or mine officials. Town plans tended to follow a simple grid, adapted to the local topography. By contrast, towns built by the W.J. Rainey Coke Company, Frick's main competitor in the Connellsville district, tended to be slightly more substantial. Rainey-built towns were distinguished by an unusually high proportion of single-family housing units. The majority of the structures in Allison No. 2, built between 1910 and 1920, were single family homes. The company also built five large, two-and-a-half-story wood-frame managers' houses. Rainey's investments were driven more by economics than altruism. As a 1913 report explained, the company's reliance on rectangular coke ovens (as compared to beehive ovens) required "a somewhat more skillful class of labor." To retain that workforce "a large amount of money has been spent…in rebuilding housing, installing electric lights, porches and general improvements to streets and sanitary conditions." One of the most distinctive company towns in Fayette County was Star Junction. Established by the Washington Coal and Coke Company, one of the first coke operators in the county, Star Junction was unusual both for its size–by 1897, there were 400 company houses and close to 700 employees–and the relative absence of labor unrest. Worker loyalty was attributed directly to company paternalism. Washington Coal and Coke subsidized everything from outdoor tent shows and company baseball teams to organized religion; Star Junction had four churches by 1900, each supported to various degrees by the company. Perhaps most importantly, the company maintained wages, kept rents low and even during the Great Depression "carried every man." The 1920s were the apex in the industrial history of Fayette County. As steel companies shifted from beehive ovens to by-product ovens located adjacent to the steel plants, coal and coke towns declined. By 1937, only six percent of the nation's coke supply came from beehive ovens; by 1950 most of the Connellsville district was tapped out. As profits diminished and budgets contracted, operators closed down mining operations and demolished housing to reduce property taxes. Firms sold occupied houses to private real estate speculators, who then resold them to former renters. By 1959 less than a third of the Connellsville district's company towns remained. Margaret M. Mulrooney, A Legacy of Coal: The Coal Company Towns of Southwestern Pennsylvania (Washington, D.C.: National Park Service/U.S. Department of the Interior), 1989. Sarah H. Heald, ed., Fayette County, Pennsylvania: An Inventory of Historic Engineering and Industrial Sites (Washington, D.C.: National Park Service/U.S. Department of the Interior), 1990.